Not too long ago, for Lone Warrior No. 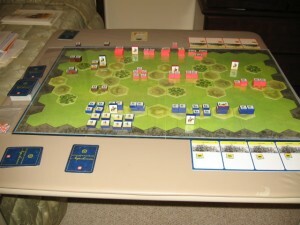 175, I did a review of the then-new board game called “Commands & Colors: Napoleonics.” Writing a review doesn’t necessarily mean the writer is an expert on the subject. In my case, the review was more a collection of my first impressions. I was aware that I had a lot more to learn about this game. So I’ve kept at it — interrupted regularly by other projects, as befits any true soloist. I’ve just wrapped up another game of CC:N and wanted to jot down my impressions. I played the Battle of Rolica (French Second Position) this time. In this scenario, the British and Portuguese have a tough assignment: They must attack the French down four north-south gullies divided by impassable terrain. At the head of the gullies, the French (somewhat outnumbered) are in position on a long, east-west ridge. I was determined to learn more about the mechanics of the game as I played this scenario, so I tried a couple of early approaches, then backed up when I’d made an obvious mistake and started afresh. My method paid off. In Rolica II, the French are heavily outnumbered in artillery units: only one of theirs, to three for the Brits/Portuguese. But that one French unit starts the battle located in what is often a dominating position in this game — right on the line between the center and a flank. Sited there, the unit can expect to be activated by command cards for either the center or the flank, meaning it’s a tough, very active unit to face. On the other hand, the Allied artillery starts out back along their own baseline. Since I decided a cautious approach was needed, I spent a great deal of time (and command cards) getting those artillery units forward to 1) silence that pesky French battery, and 2) start grinding down the French infantry in preparation for an all-out assault on their line. That was the plan and it worked pretty well. 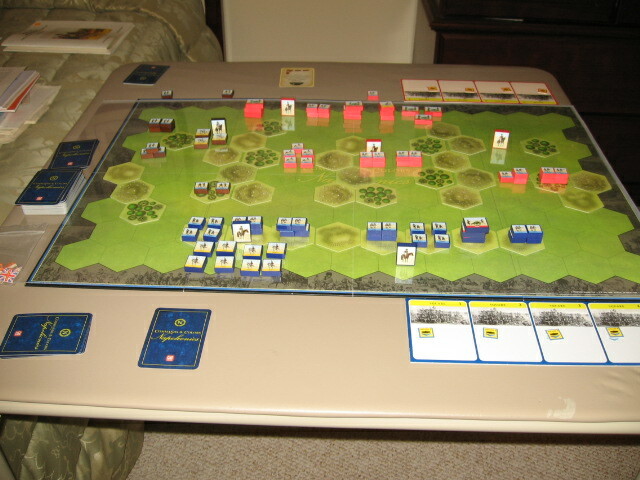 However, it took 11 complete turns to finally get the Allied guns forward far enough to eliminate the French artillery. It was then time for the next phase of the assault, the main infantry attack on the French line. The French side must play a patient game. But, by the time the French had lost their artillery, they had also built up a decent hand of command cards for their left flank, where the weaker Portuguese units were located. A counter-attack by the French in that sector seemed like a good idea. The alternative was just to sit and wait for the Allies to bleed them in position. So, the French attack went in. But, before I could play all the command cards I’d built up for the French left, the attack had fallen apart. The French did manage to destroy one Portuguese unit, but then ran afoul of a British artillery unit. The Allies drew the command cards they needed, and rolled the dice well. The attacking French units were both nearly (but not quite) destroyed and fell back. Action then shifted to the other flank, where the Allies played a Grand Maneuver command card that allowed them to move four infantry units up to the ridge. With the French out of command cards for that flank, the Allies then made a devastating attack, eliminating three more French units. Then, on the last turn of the game, a British artillery unit finished off one of those one-block French units left over from their ill-advised counter-attack. The game ended with five Victory Banners for the Allies to only one for the French, in 27 game turns. Oh, and none of the cavalry units on either side ever got into action on the restricted field. The standard role of cavalry in this game is to hang around, waiting, then trying to finish off depleted enemy units, for end-of-game Victory Banners. It just didn’t play out that way this time. As they say, CC:N is a slower moving, much more deliberate game than, say, CC: Ancients. There were times when I was frustrated by the slow early going of my Rolica II re-fight. But things really picked up toward the end. I’ll remember the lessons learned next time: Use artillery early to soften up the opposition, then send in infantry (with more artillery support) at the right moment, and, if possible, finish the enemy off with cavalry mopping-up support. Sounds Napoleonic enough to me. This entry was posted in Battle reports, Periods - Napoleonic. Bookmark the permalink. Interesting food for thought, as I find that the French dominate in most every scenario, given the problems of the basic design. Dale, so far in my games, the French have tended to get worse Command Cards than the Brits, so I may very well get different results when the luck of the draw evens out. It’s also possible I’ve been playing the French on the defensive too passively and ceding advantage to the Brits. Just wondering, what are the design problems? My impression has long been that the Commands & Colors system is solid. What am I missing? Great review, George. Thanks for sharing your experience. You surely do have patience–you’re a natural Wellington. Mike, any patience on my part with this game is hard-earned. I’m usually inclined to jump in and slug it out, but I’ve learned this much about CCN: Attacking without careful preparation is a good way to get your head handed back to you.